Commuting or other long trips are always accompanied by the passage of time that makes it becomes dull and boring. Especially cookie-cutter skyscrapers in the city can not ease the self-balancing electric scooters drivers' spun mood. Therefore, it tends to make the entire journey thus becomes exhausting. So, why don't you try to use FOSJOAS V9? Its loudspeaker box must be able to make music your best lifter on the trail and let you become the most fashionable scenery on the street. First of all, let's make acquaintance about the basic statistics of FOSJOAS V9. It is 1288 mm high, 613 mm long and 587 mm wide and uses 14 inches tires. Its body weighs 22.4 kg and 120 kg is its maximum load. The whole appearance becomes more fashionable and youthful with its white streamlined body and ornamented with blue. The handlebars made by light grey silicone feels so good, meanwhile the color makes it more fashion and it won't be discolored with long-term use. FOSJOAS V9 self-balancing two-wheel electric unicycle uses the most advanced high pressure casting process of magnesium alloy as framework of its main body. Magnesium alloy is a new environmental protection material emerging during the 21st century, which causes no pollution and can be recycled as well as reused. At the same time, magnesium alloy with good capability is more light, high strength, high temperature resistance, corrosion resistance, fatigue resistance compared with other materials. It is now widely used in the automotive industry, electronic industry, aviation, aerospace and other fields. Using magnesium alloy is not only according with the product features of electric unicycle that low carbon emission and environmental protection, but also meeting the requirements of lightweight and high strength. 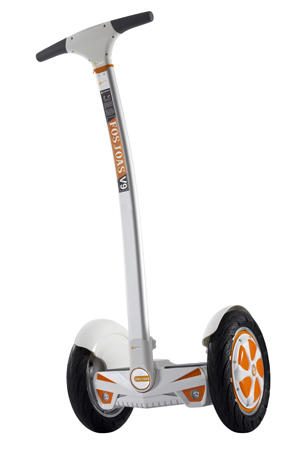 Therefore, it can be said to be the best choice of material for the main body of electric scooter.